The sled dog team heads out at Sunrise on another Go North! exploratory day. Yearning for arctic adventure? 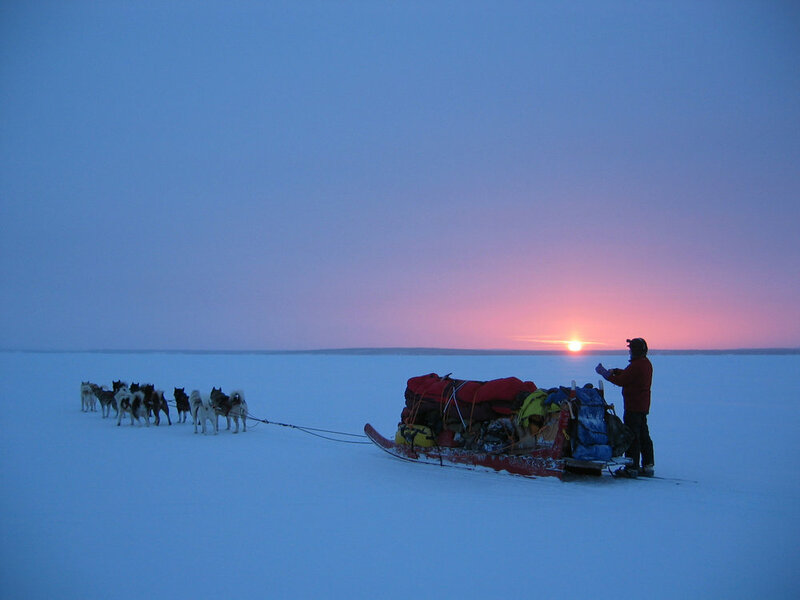 Explore with GoNorth!, the University of Minnesota science education team that’s exploring the Arctic via dog sleds to research the impacts of climate change and report back in real time. About two weeks ago, the team left Qikiqtarjuaq, after running into a polar bear—and learning about the Inuit communities that subsist, in part, by hunting those bears. They’ve befriended an eight-year-old boy, Brad, who hunted his first polar bear this spring. The oversight organization allows 30 polar bears to be hunted each year, 15 in the spring and 15 in the fall. Once Brad’s name was drawn in the lottery, he had 24 hours to complete the hunt. His family will subsist on the meat, and may sell the skin for extra income. The team is traveling through an area that has one of the highest polar bear populations in the world. The strong ocean currents in the Davis strait create lots of open water that makes for ideal seal hunting. Learning about the region is one of many objectives of the team that’s been traveling by sled-dog since early April when they set out from Minnesota in the pouring rain. Last week they mushed through Nunavut Territory, Canada, and they plan to continue to Arctic Bay, near the community of Pond Inlet, in the high Arctic. They expect to arrive the first week in June. The team visits communities along the way, presenting their “What’s Climate Change to You?” program—the heart of the Aaron Doering / University of Minnesota-led National Science Foundation grant--at local schools. When able, they overnight in these communities, sleeping in the school gym or other host shelters. Still, because the dogs are rambunctious and highly vocal on the trail, the humans sometimes camp with the canines on the edge of town--or more often, as communities are few and far between, along the trail. Chris Ripken, the team's teacher explorer, meets students along the journey. In addition to local outreach, the team takes samples and makes observations for a variety of science experiments, including an investigation of traditional ecological knowledge, and NSF-funded projects examining black carbon in snow and a prototype network for measuring winter precipitation. Weekly, the team participates in live chats and updates the GoNorth! Web site with trail reports and photos. The team’s stars are the polar huskies, sled dogs that are a combination of northern husky breeds: Alaskan Malamute, Greenlandic Husky, Siberian Husky, Alaskan Husky, Mackenzie River Husky, and Canadian Eskimo. These pack dogs work as a team, and are bred to run, and are cuter than any stuffed animal. Beacon the sled dog greets fans. Since 2006 the GoNorth! team—two- and four-legged members alike—have lit out on long mushing trips around the Arctic to engage K-12 students in the natural sciences via an interactive Web site, science observations, and live events from the field broadcast via the Internet. Previous expeditions covered remote regions of northeast Alaska and Chukotka in Russia. The last three years will bring the team to Canada, Greenland, and Scandinavia.